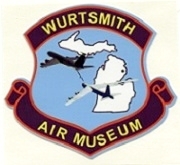 Wurtsmith Air Museum was established in 1994 for the purpose of preserving the history of Wurtsmith Air Force Base and aviation in northeast Michigan. The museum contains artifacts and memorabilia relating to the military, along with static displays of a UH-1H (Huey) Helicopter, a T-33 Jet Trainer, an L-19, a 727, and several other civilian aircraft. There is a new "Wurtsmith Room" where pictures and collectibles from WAFB are displayed. The gift shop contains patches, pins, models, shirts, hats, mugs, toys and other items for sale. The museum is open Fri., Sat., and Sun. from 11 AM to 3 PM from mid-May to mid-Sept. Admission is $5 for adults, $3 for under 12 yrs., and under 5 are free. The museum is all handicapped accessible. It is a 501c3 non-profit organization, completely run by volunteers. We welcome group tours; bus parking is available. Special events are planned throughout the summer. Fri. Sat. Sun.,11 AM-3 PM, mid-May to Mid-Sept.